Of all the potential uses for a smartphone, "getting your grilled-cheese sandwich before all those other people waiting in line" should be near the top of the list. Alas, that particular phone feature has largely been the stuff of fantasy...until now. Updated 8/29/2011 to add a video tour of "The Melt" kitchen. 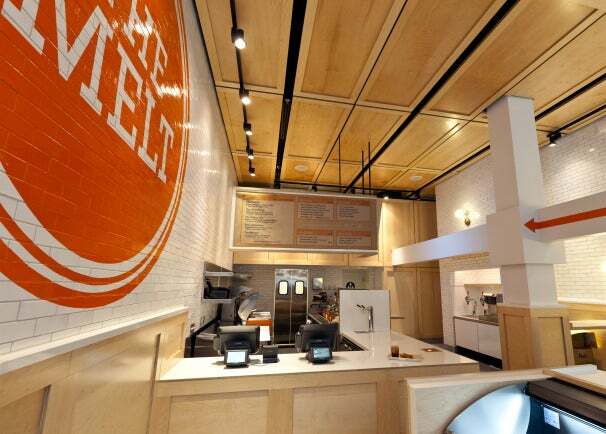 The Melt is a new chain of grilled-cheese restaurants with its first location opening up in San Francisco this week. You'll be able to order your sandwich the old-fashioned way by waiting in line and speaking to the cashier, but you can also skip the line entirely by placing an order on your mobile phone. Doing so creates a QR code for your order, and holding the on-screen code over a scanner in the restaurant gets your order on the grill. Whichever way you decide to order, you'll get your grilled cheese within 2 minutes, says The Melt's founder, Jonathan Kaplan. 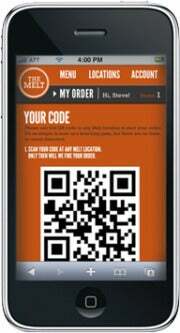 Placing an order via smartphone doesn't require downloading an app, as simply visiting The Melt's website on your phone and entering an order creates the QR code. That makes the phone-ordering process compatible with any Web-capable phone. In addition to letting you bypass the line, the phone-order system ensures that you get your food hot when you're picking it up on the go--nothing gets cooked till you order it, and then it takes only two minutes. Once the chain has more locations, you'll also be able to choose a location to pick up the order after you decide that you really want a grilled cheese. If Kaplan's name sounds familiar, it's probably because he has a history of rethinking traditional technology to make things a lot quicker and easier: Kaplan was the CEO and founder of Pure Digital, the makers of the popular Flip pocket camcorder that changed the video-camera landscape before the Flip was bought (and unfortunately buried) by Cisco. "I believe the youth of America will use their smartphones for everything," says Kaplan. "We're using technology to make the user experience better... (and) specialized cooking equipment to make melts reminiscent of what mom used to make." 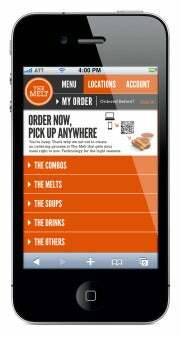 Kaplan says that the restaurant chain also has more phone-order options in the works for the next six months, including a "geofencing" feature that knows when you're near a Melt franchise and sends a text message to your phone to ask whether you'd like them to put a sandwich on the grill before you walk in the door. Besides the smartphone spin on ordering your food, each restaurant will offer free Wi-Fi access, and the high-tech features extend into the kitchen. In addition to aerators to keep the restaurant's soups up to snuff, the special Electrolux grills used to make the sandwiches have been custom-made for the restaurants and patented. Kaplan says that the grills have been designed to cook two sandwiches at a time with a total cooking time of 1 minute, and the roof of each grill is coated with a nonstick surface that keeps butter-usage low. During a prelaunch event at the flagship San Francisco restaurant, Kaplan gave a brief tour of The Melt's kitchen tech. I can also say that those fancy machines make a really good grilled-cheese sandwich, according to my taste buds. The soup's good, too. And I'm not sure if there's any high-tech involved in making their pickles, but they're the perfect blend of sour and salty. Unless you're used to living in the Bay Area, $5.95 for each sandwich and $8.95 for a sandwich-soup combo may sound a bit pricey. However, the new chain offers a great option when it comes to paying, too. When settling your tab, you can opt to have your change donated to a charitable organization dedicated to fighting world hunger. The Melt also uses all recyclable and compostable packaging in its restaurants, meaning that the chain will be almost entirely waste-free. "We have no trash cans because there is no trash," said Kaplan. Instead, the restaurant has recycling and compost bins only. The first Melt franchise opens Tuesday, August 30, at 115 New Montgomery Street in San Francisco.